"Our Keystone State (Pennsylvania) is aptly named in many ways, for it's central position biologically as well as historically. Southern animals approach their northern limits here, and northern animals their southern boundaries. Beside the many species which live here all year, others migrate through or visit during severe northern winters ... We have lakes, forests, bogs, rivers, meadows, ponds and marshes. This precious diversity of habitat allows the variety of birds and mammals which add so much to our joy of living." While it is impossible for me to decide my favorite winter bird, the tufted titmouse is near the top of my list. 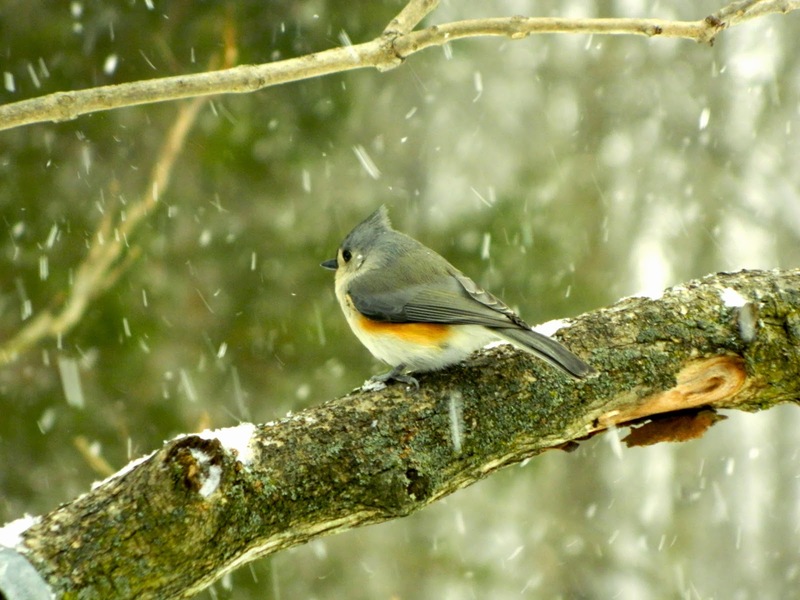 The tufted titmouse is 6 inches long and slate gray in color with a white chest and belly. It has rusty brown flanks. It is most recognized by its pointed crest. I love its bold perkiness and seem to take a lot of photographs of the tufted titmouse, enough to devote a posting to this cute little fellow. I think I will do that soon. Once very common in Pennsylvania, the bluebird has declined in numbers in the last 50 years, partly due to the lack of tree-cavity nesting spots. 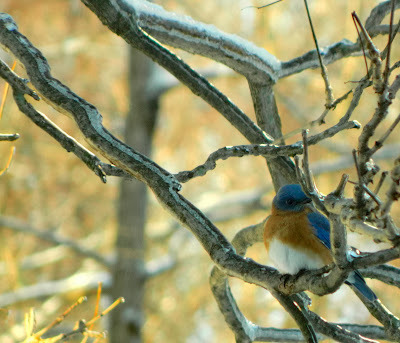 Encouraged by the North American Bluebird Society, my H.H. 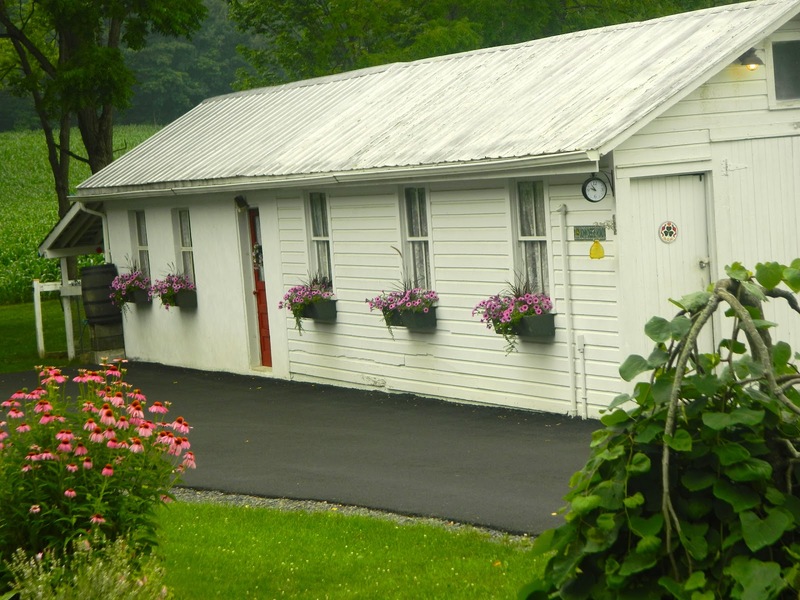 erects many bluebird nest boxes in an effort to attract them to our gardens. Suitable boxes must be the exact size to let bluebirds in and keep competitors out. Both male and female are blue with reddish throat and breast, but the male is much brighter. 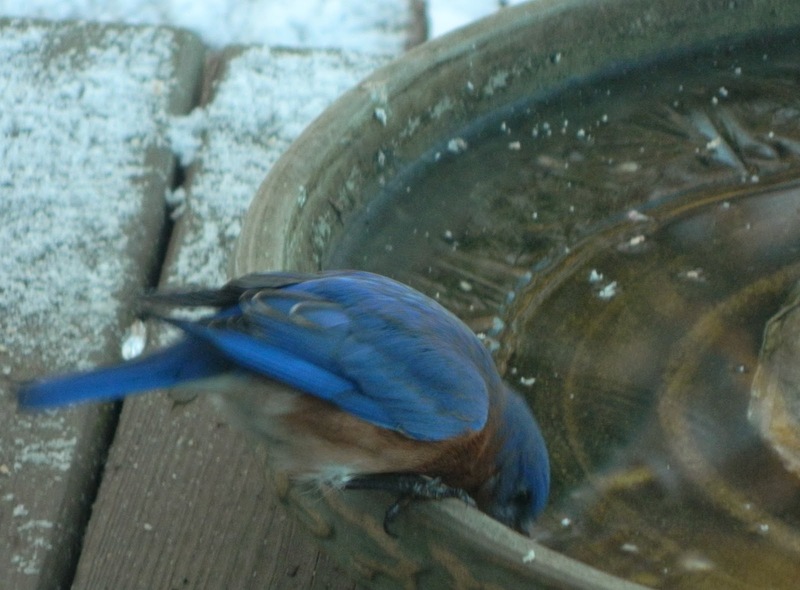 In summertime, bluebirds don't come near the back porch, but during the winter, every day they visit the heated water dish that H.H. placed there. 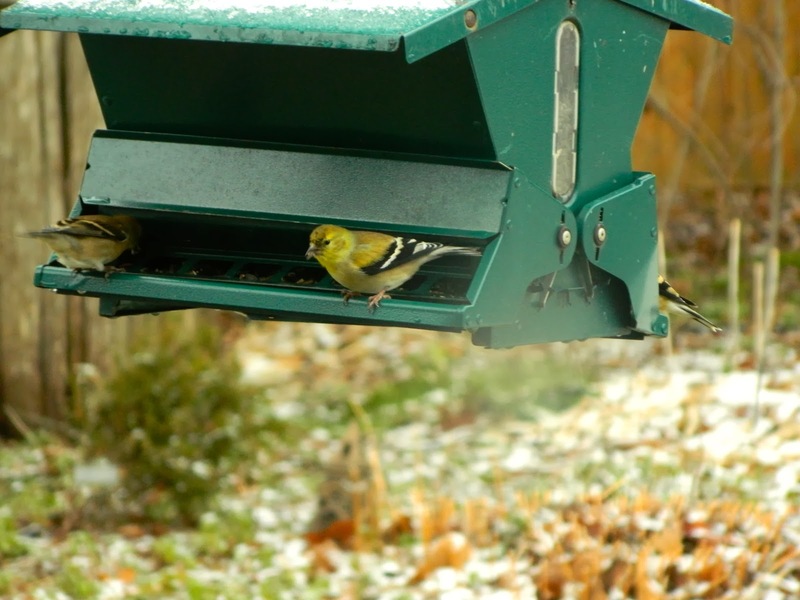 I can't stress enough the importance of providing heated water for winter birds. 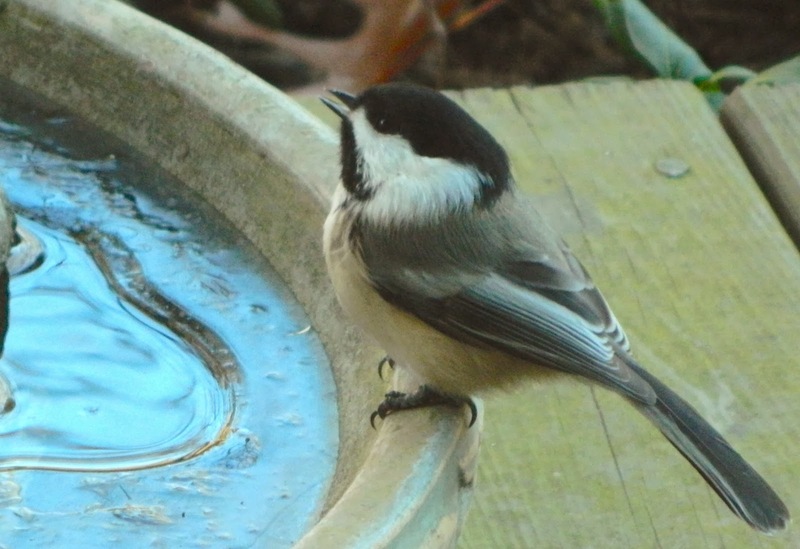 For more information read 'Winter Bird Bath Tips' in the Birds and Blooms blog. The American goldfinch is sometimes called the 'wild canary' -- an apt name in the summer, but it loses its yellow feathers in the winter and becomes a dull olive color. Many of them move south for the winter months, but I always have a small flock that stays all winter. I think they stay for the purple coneflower seeds that I leave standing and for the Nyger Thistle that H.H. 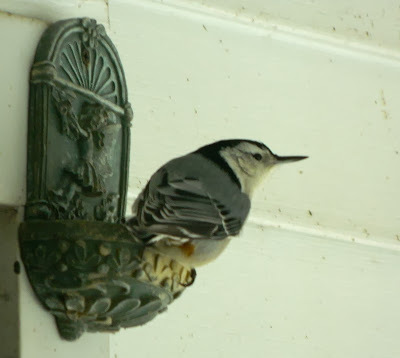 puts in the bird feeder. 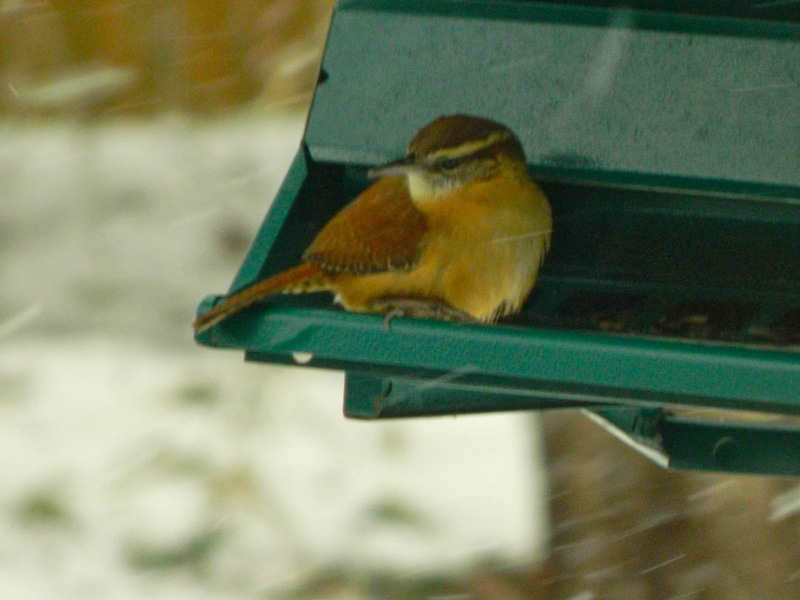 I love the little (5 1/2 inches) Carolina wren. It is one of the few birds that will sing throughout the year. The male is known to sing up to 40 different song types. Also, they have long-term mates, remaining together throughout the year in permanent territories. The blue jay is a large (12 inches) bright blue and white bird with a black necklace. It's feathers don't have blue pigment; refracted sunlight casts blue light. 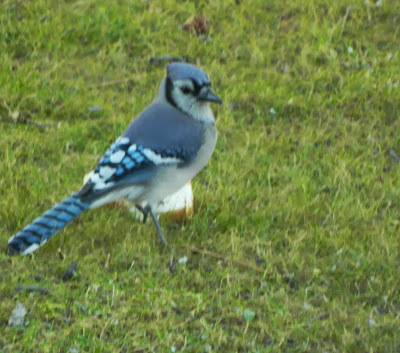 The blue jay is not a favorite of mine as it is known to eat eggs or young birds from the nests of other birds. An interesting fact: it is one of the few birds to cache food. 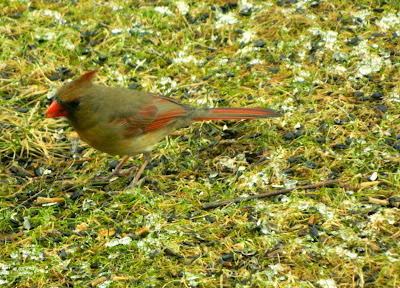 The male Northern cardinal is 8 1/2 inches and all bright red with black around the base of its reddish bill. This species is named after the red robes worn by Roman Catholic cardinals. It has a large crest. 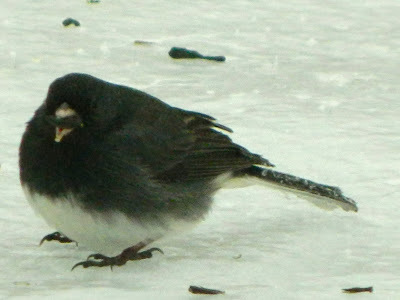 The female is grayish brown with a bright red bill. They always come to the feeder in pairs and I love to see the male feeding the female during courtship. This is another bird that can be heard singing at anytime of year. While you usually see the charming English robin on British Christmas cards, the bright cardinal graces American ones. The round, chubby dark-eyed junco is one of Pennsylvania's most common winter birds, usually seen in southern PA, but this year there are several in my northeast PA garden. 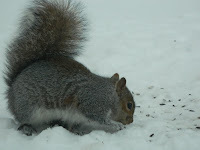 They are most comfortable on the ground, 'double-scratching' with both feet to expose seeds and insects. 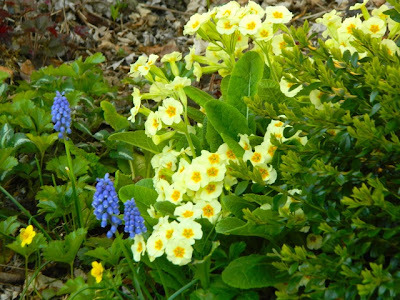 They provide a valuable service to the gardener as the love weed seeds. The black-capped chickadee is found across the whole of North America. He is among the friendliest of back-yard birds, being very bold and inquisitive. 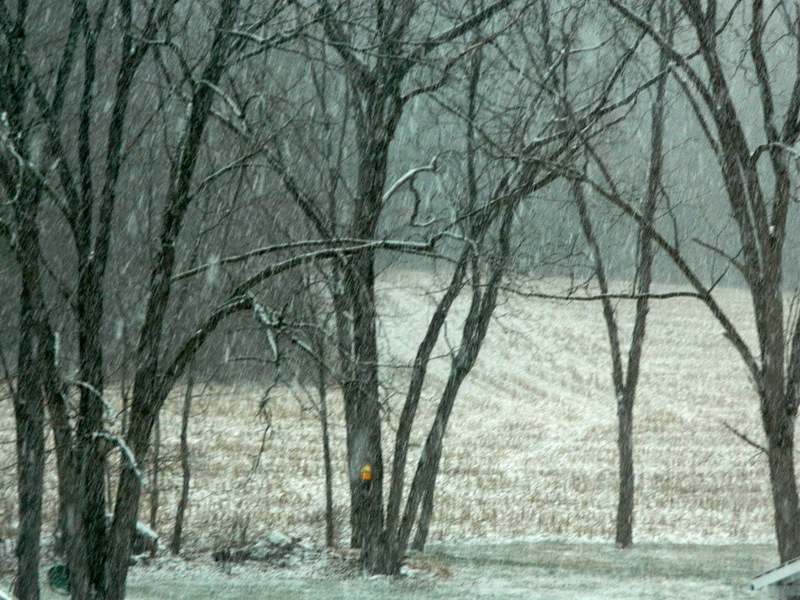 He is around all year long, but is most noticeable in winter. 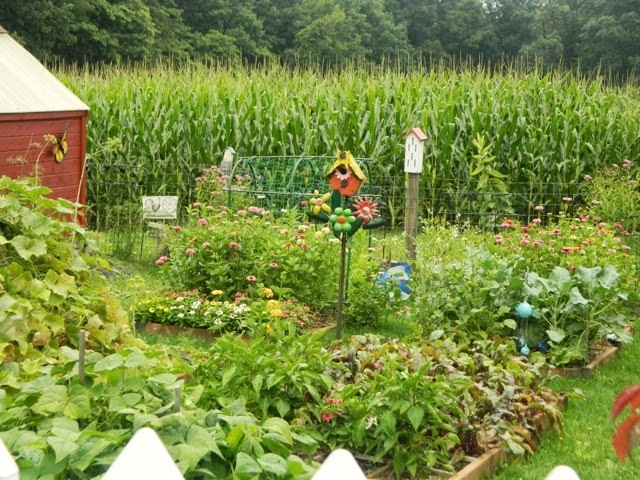 He loves insects, so is a great benefit to farmers and foresters. 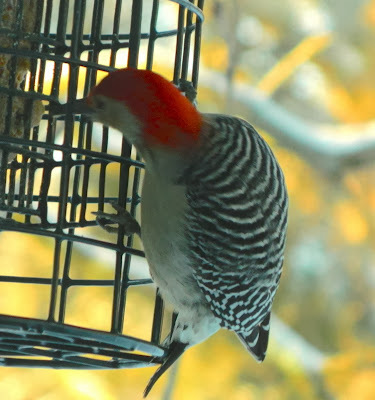 Three types of woodpeckers visit my garden: the pileated woodpecker which I see only in the summer, the downy woodpecker, and the red-breasted woodpecker. 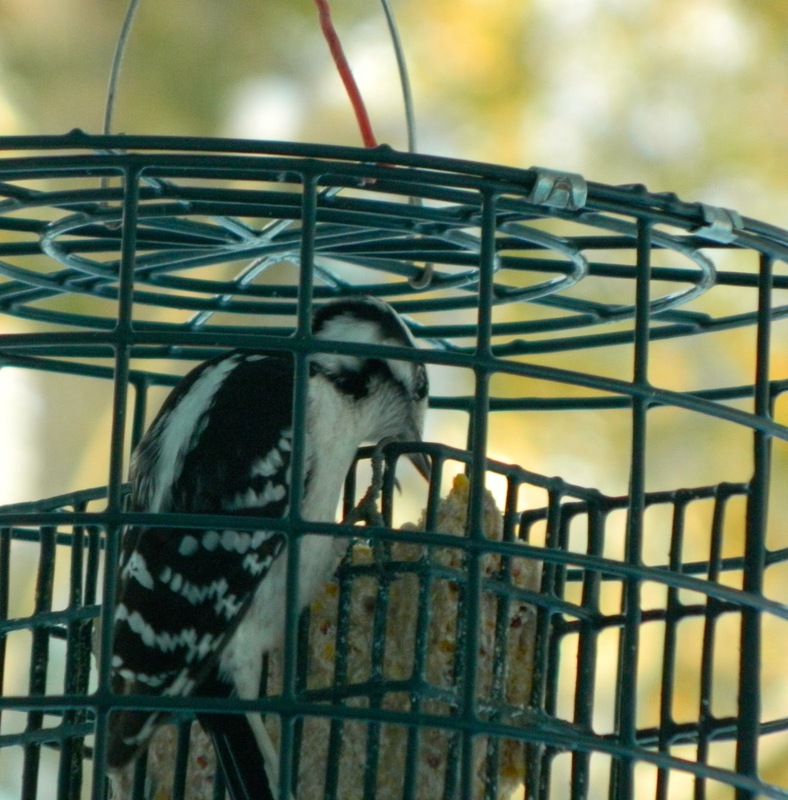 The sparrow-sized downy woodpecker is the most common backyard woodpecker. As you can see, he is small enough to climb right inside the suet feeder. The red-breasted woodpecker is much bigger than the downy being 9 to 10 inches long. 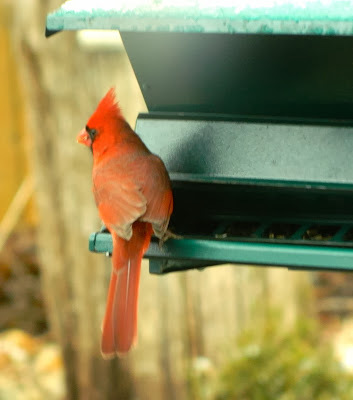 Watching the birds that visit the feeder and bird bath during the winter months is my favorite activity, and every year I look forward to the Great Backyard Bird Count, a joint project of the Cornell Lab of Ornithology and the Audubon Society, held in February. For more information click on the poster in my sidebar. If you live in the US or Canada please plan on joining in the fun. 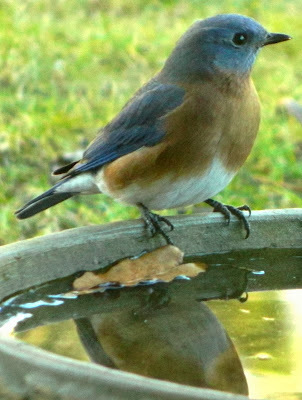 As I said at the beginning of this posting, it is impossible for me to name a favorite bird, but if pressed I must say the sweet bluebird brings me much joy. Do you have a favorite backyard bird? I hope your Christmas was as wonderful as mine. We had a big Boxing Day celebration here and I was in heaven with my family around me. I made all the traditional English foods and reveled in keeping our English traditions alive with plum pudding, mince pies, trifle, and Christmas cake. Wishing you a very happy new year, my dear gardening friends! The winter pond-garden looks a little less scruffy with a dusting of snow. 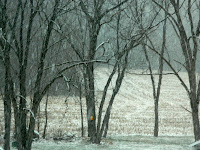 Winter is here with snow, ice, and subfreezing temperatures. 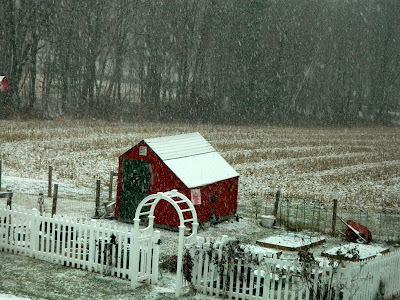 Officially, the first day of winter doesn't arrive until December 21, 2013 at 12:11 pm EST. That is the December solstice marking the day of the year with the least hours of daylight in the northern hemisphere. 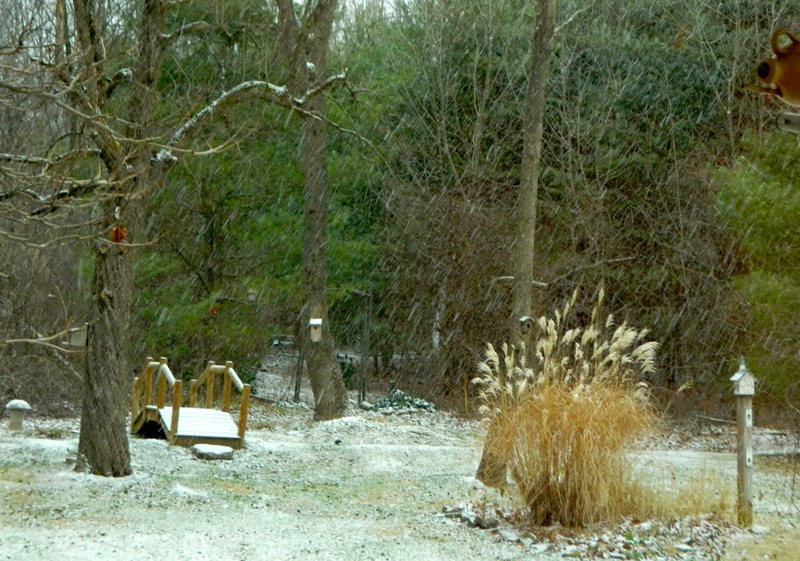 I am happy to live in a region with four distinct seasons as I welcome a period of rest from gardening chores. I admire, but don't envy, those gardeners that are able to tend their gardens year-round. Therefore, I greet the seasonal change with joy, celebrating in several ways -- usually from my favorite chair by the fire in the den: I pour over photographs of the past year to see what worked and what didn't, I list my New-Year gardening resolutions, I plan for the new gardening year, I purchase or borrow new gardening books to help with my planning, and I just sit and watch the winter birds. 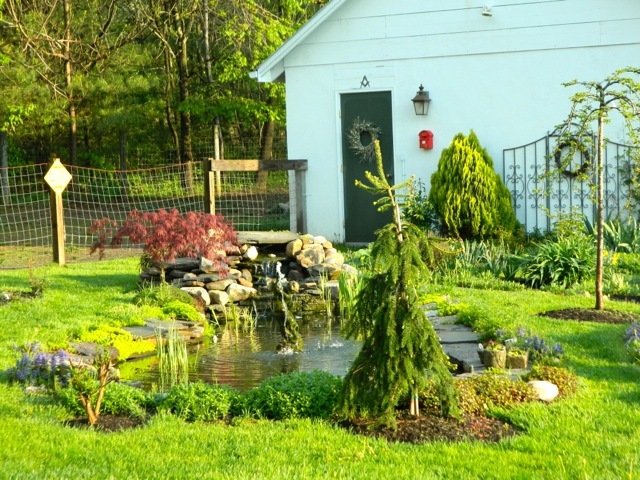 I am happy with the dwarf trees we planted around the pond. The new picket fence successfully hides the ugly pasture fence seen in the previous photo. 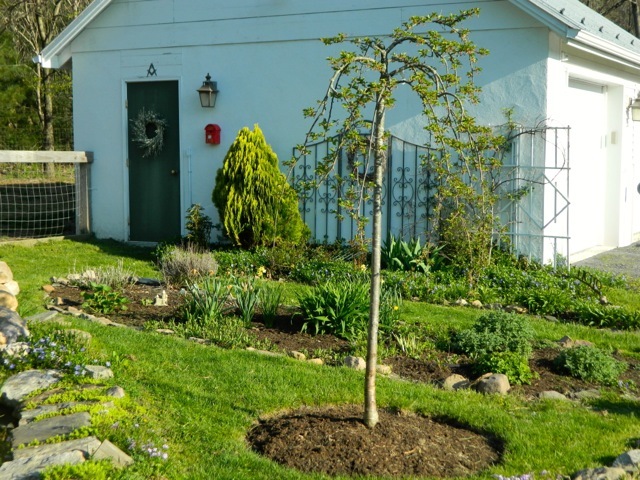 New plantings in the shade garden provide spring color. I can't believe I didn't take any pictures of my newly planted snowdrops in the shade garden. But they were pretty much 'sleeping' this first year. I do hope they survive for the spring of 2014! 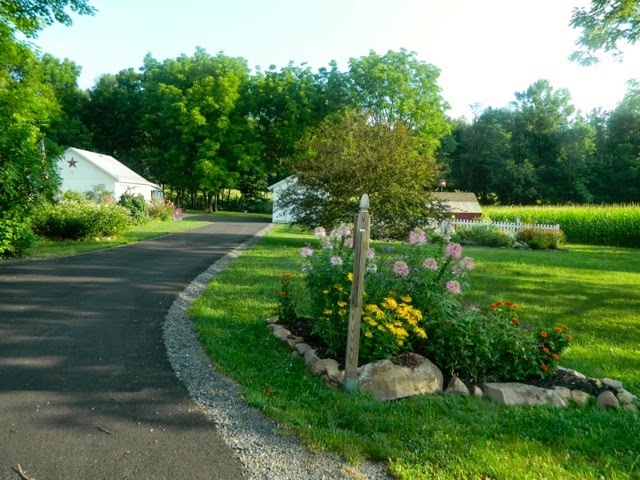 Loved the bed of annuals at the entrance to our property. Great window-box plantings on the tractor shed. I will use the same combination next year. 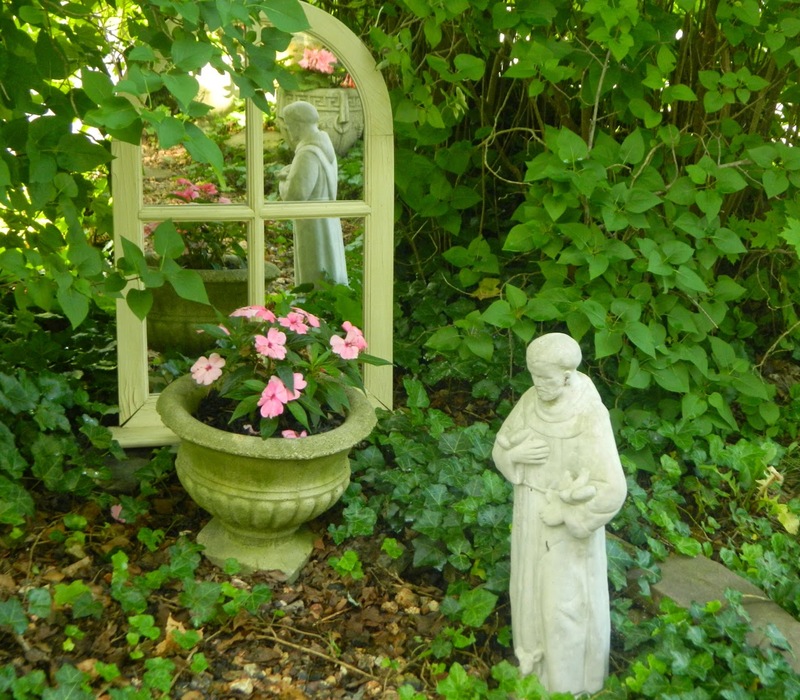 One of the many mirrors I placed in my garden this year. 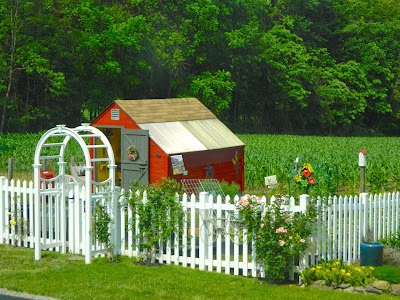 The newly-painted potting shed received many compliments. 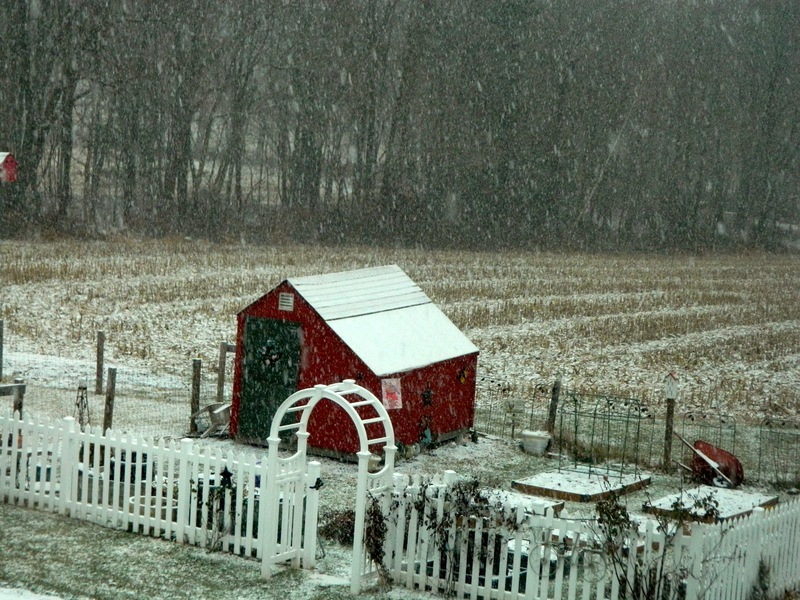 The potting shed with snow yesterday -- a dark, dreary day. I adore the new, tin sculpture in the kitchen garden. 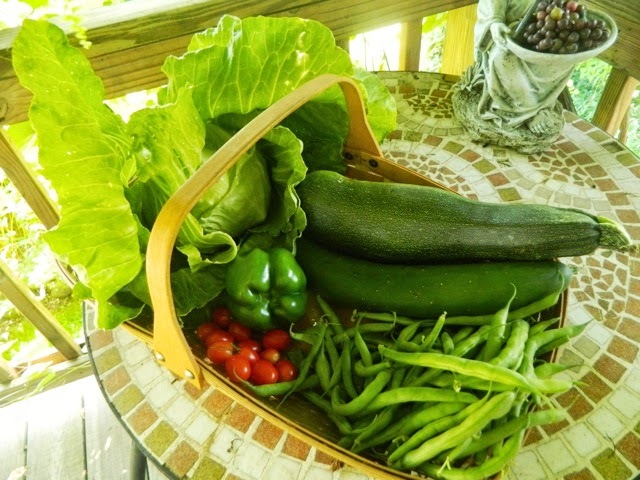 We enjoyed a steady supply of produce from the kitchen garden. 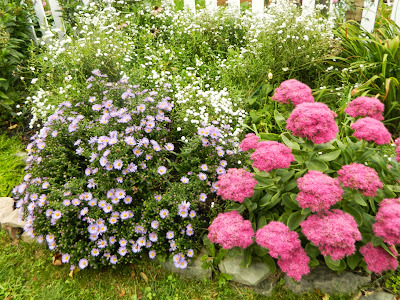 New plantings of asters and sedum in the cottage garden for fall blooming. The weeping cherry didn't look so good at the end of the year. The planting spot proved to be quite wet. I'm not sure about this weeping cherry. It may have been planted in the wrong place. 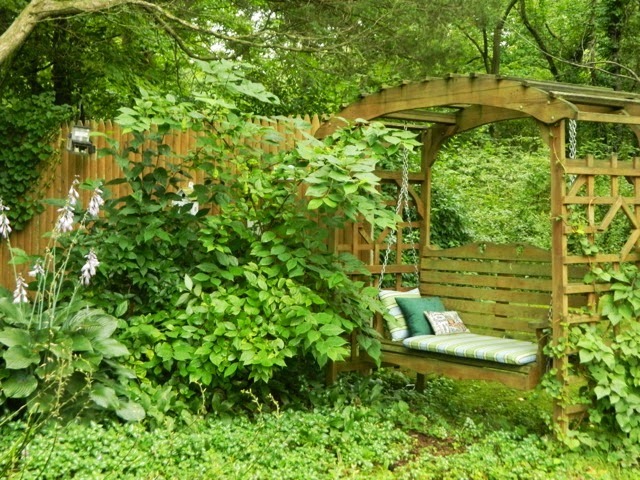 Lamium covered the path to the swing. I am not sure I like it. 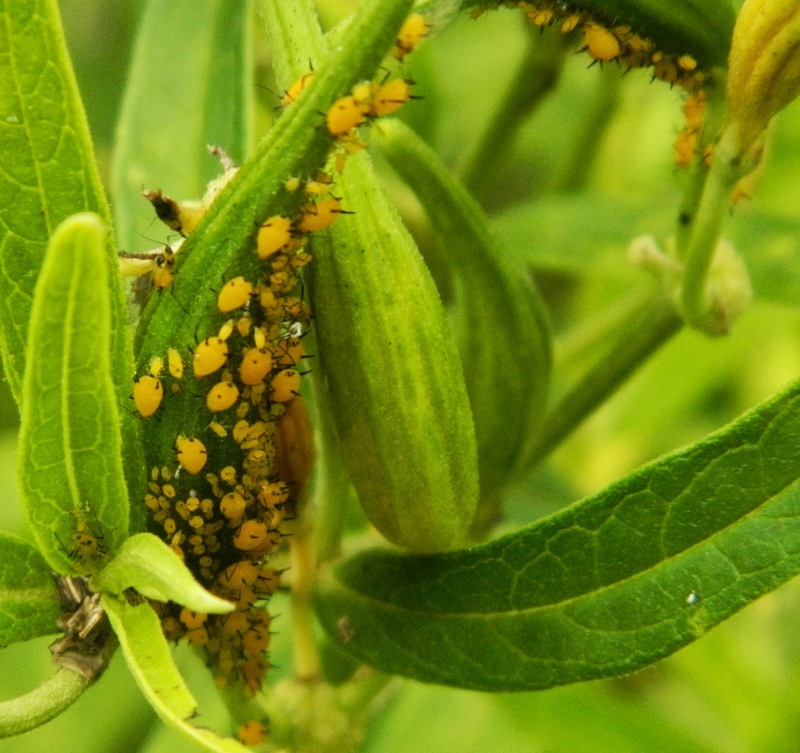 We had the usual amount of pests visit the garden. I didn't successfully eliminate the aphids. 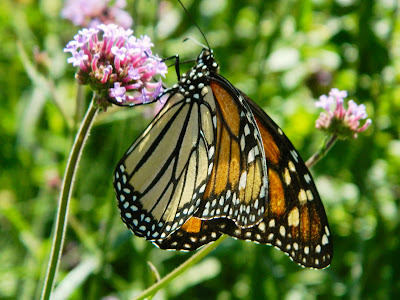 My biggest disappointment was the lack of monarch butterflies. One of the rare monarchs to visit in 2013. We neglected the Woodland Walk this year for a couple of reasons: first, to cut down on work and second, my fear of the black bears that we see passing through there. The entrance to the Woodland Walk across the bridge over Bluebell Creek, yesterday. Next year I plan to focus on enhancing the walk along Bluebell Creek and let the main Woodland Walk go. I have started designing the 2014 kitchen garden and I am making plans to rectify some of the problems identified above. 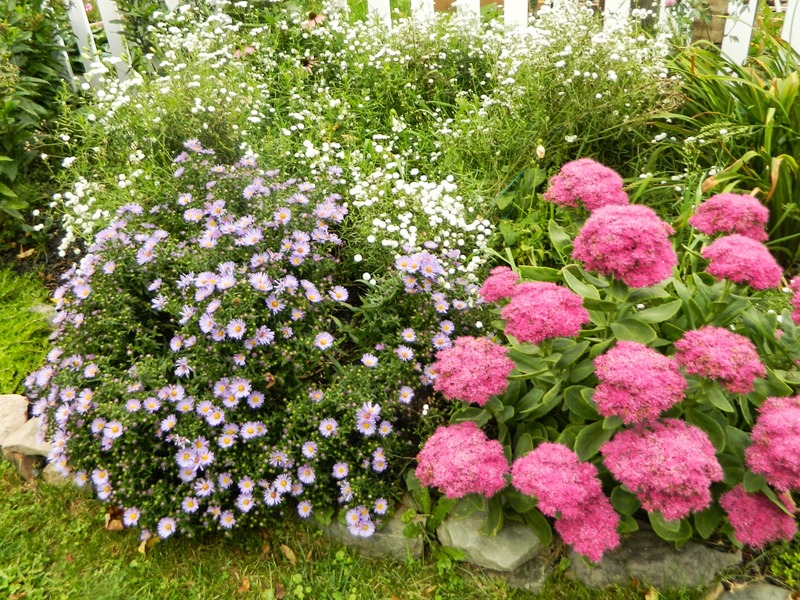 I'll list my New Year gardening resolutions in a posting coming-up soon. I have added some wonderful new books to my garden library recently. 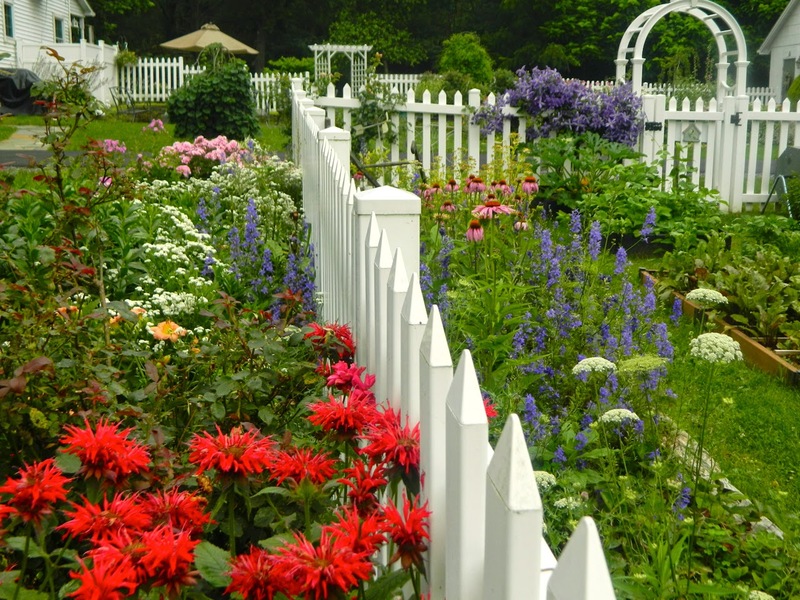 They are all about cottage gardening. My favorite is The Cottage Garden by Christopher Lloyd. 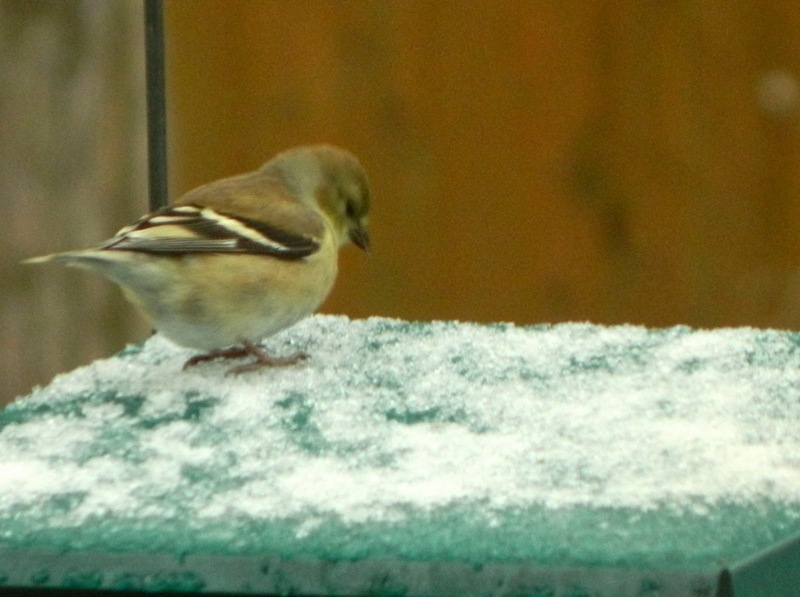 One of my greatest joys in the winter is watching and photographing the birds that visit my bird feeder and water dish. 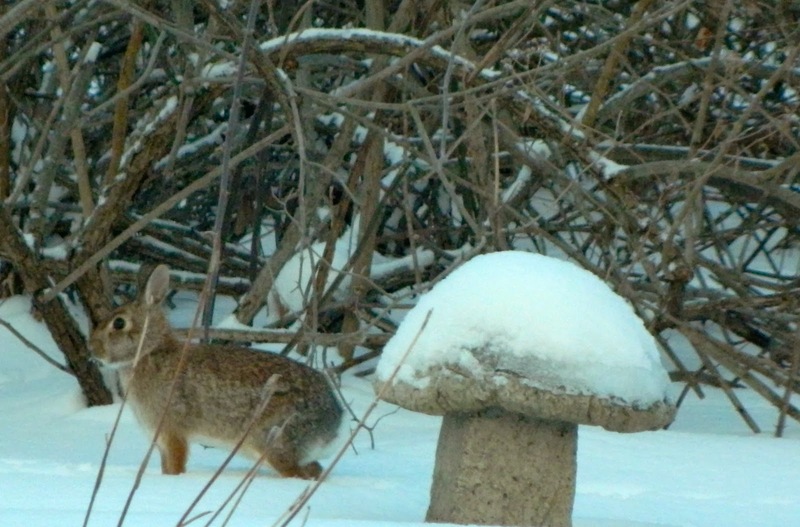 In the near future, I will devote a posting to some of the beauties I've seen so far this winter. 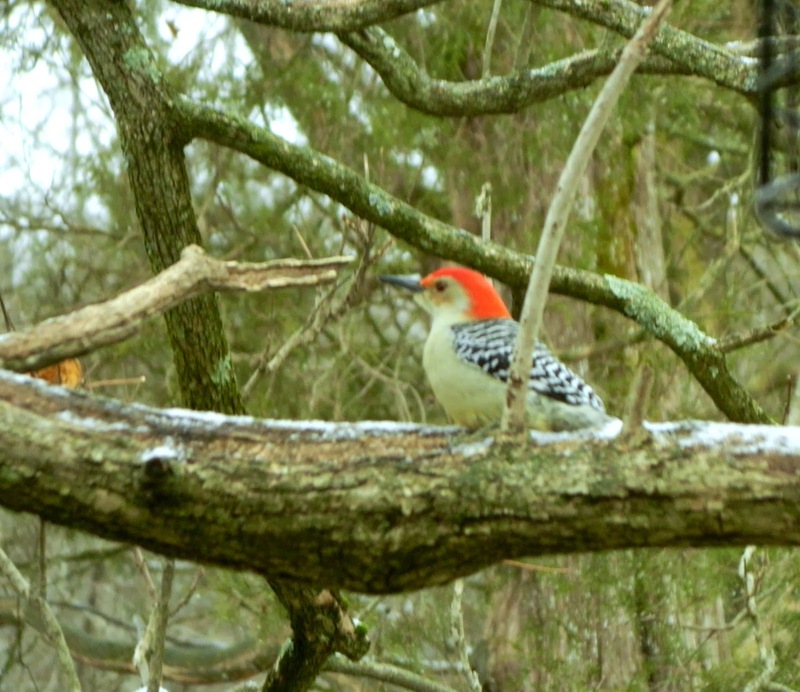 A Red-bellied Woodpecker visited yesterday. Yes, I welcome winter and celebrate its coming. I am joining Donna at Gardens Eye View for her Seasonal Celebrations Meme. Do visit her wonderful blog and maybe join in! 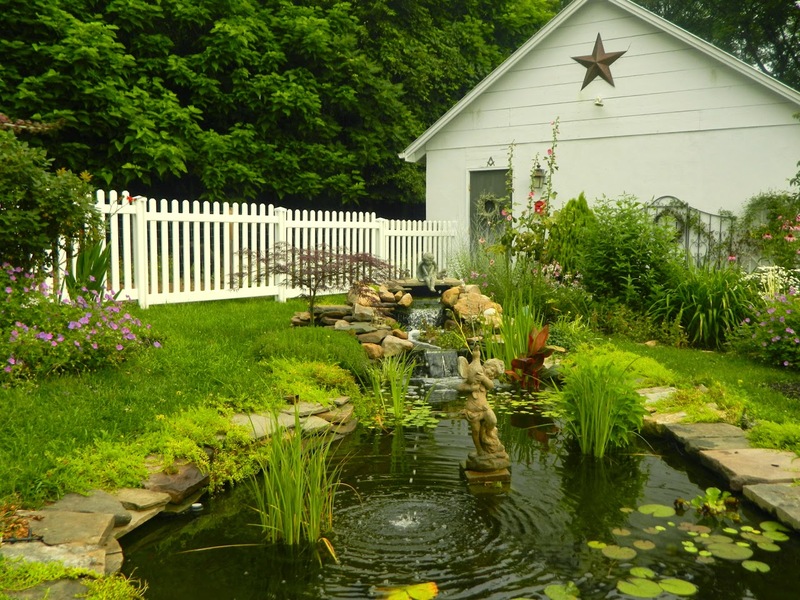 I would love to know how you celebrate the change of season. Stay warm this winter, or stay cool if your season has changed to summer!